moving creatures etc. And the rear camera stays protected from dust and water, while still delivering clear 640*480p recordings. with a glass lens delivers superb live video to the display. Select reverse gear and the dash camera will automatically switch to full rear view with parking guide line, this feature helps you park safely. 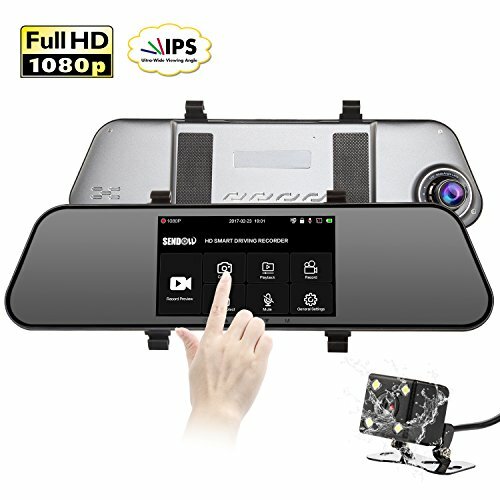 Working temperature: -4 °F to 140 °F, the dash cam can resist overheated or colder climate, camera will auto shut down when it is over heat, protects itself & car. 1. Please use genuine 32GB class 10 TF card, format then restart, and format SD card monthly to maximize the lifetime of memory card. 2. Please activate G-sensor and set loop recording before using. 3. Battery is mainly used to save files in emergency, please charge Dash Cam while using. 4. Sendow mirror dash camera only supports 12V power supply, vehicles with 24 volt need additional buck converter. 5. Will remind the left video recording time and remaining number of photos stored in the current resolution when SD card when SD card has remaining storage.